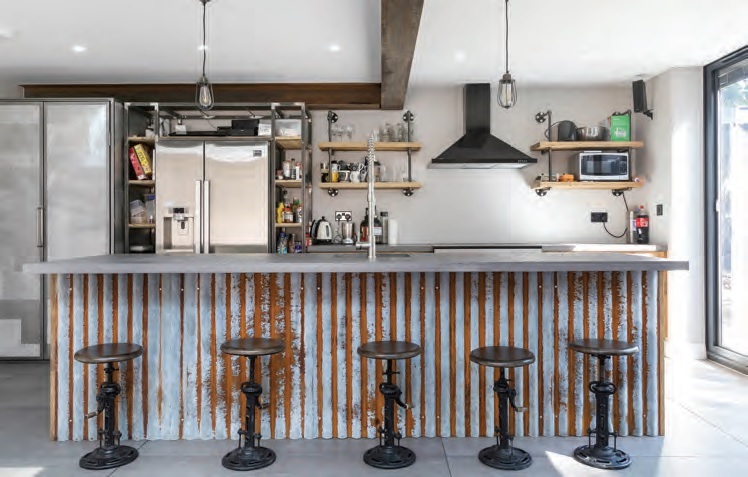 This kitchen was made using recycled metal and industrial fittings – dRAW Architecture. 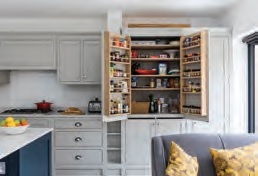 Larder cupboards are easier to access than big pull out drawers – Run Projects. 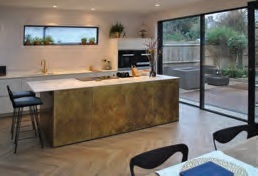 Island cloaked in brass contrasts with classic, handle-less white kitchen – Eclectic Interiors. 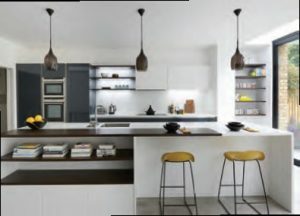 For social entertaining put the hob on the island – Simply Construction. 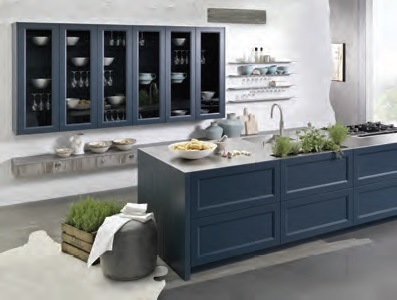 Maximise the island’s usage with built-in shelving – Hub Kitchens. An L-shape or island allows access from all sides and can be multi-functional – a snack bar, a dining table or homework area. 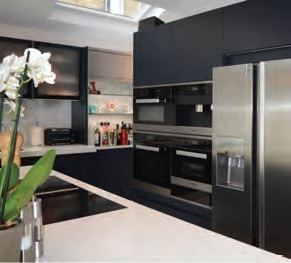 If the safety of young children and a clear cooking area are paramount, opt for a U-shaped or peninsula style layout. Raising the oven to eye-level is safer and better for your back too! 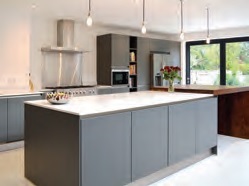 Induction hobs look elegant and have safety locks, no flame and the surface stays cool while cooking. 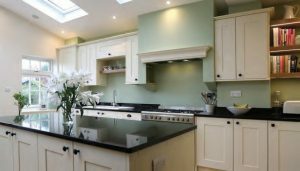 The choice of worktop is key. 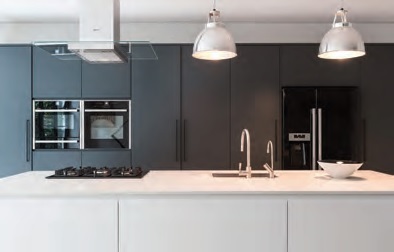 Porous surfaces like wood and natural stone can be very difficult to clean while Quartz, Corian and Porcelain are hard-wearing, stain resistant and easy to wipe. Doors and drawers are best in a matte finish to avoid fingerprints. If you cook for large groups, an extra oven and a warmer drawer are invaluable. Boiling water taps are excellent time savers. 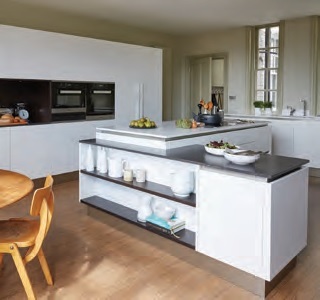 Different level worktops in alternative finishes help zone an island – Hub Kitchens. 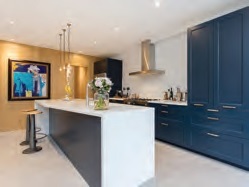 White Corian work surface, deep blue units and warm wood back wall – Kitchen Coordination. 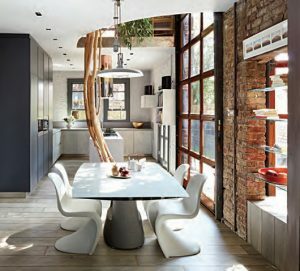 Position your eating area nearest the garden –Kitchen Connections. 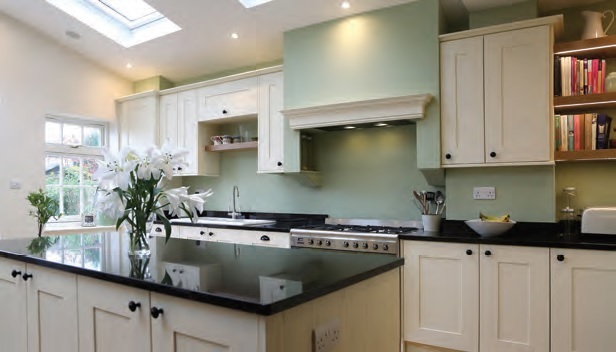 Shaker-style kitchen in a rear extension from Zenico. 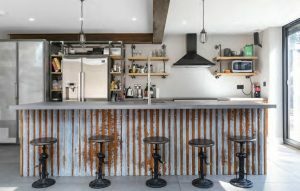 The trend for mixed materials is going nowhere – Eclectic Interiors. The island continues to be a major feature in modern kitchens and whether it is large or small you need to decide how it’s going to be used. If you have a sink on the island you do not want it covered in washing up products. It is best to use a base unit with special sink base drawers, as these will give you easy and flexible access to cleaning products and keep your island clear. set into the hob, are designed to pull the cooking smells and moisture down rather than up. The best brands work well ducted out or when recirculating through a filter. This has the extra advantage of having clear space over your island and an unobstructed view of the room. 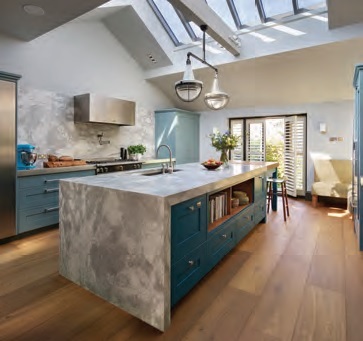 Use a patterned material to make your island a focal point – Roundhouse. Frosted glass, pull-down shutter style and solid finishes all work well together – Kitchen Connections. 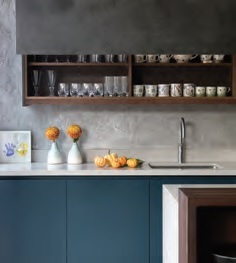 Clever door panels leave a neat finish on wall cabinetry – Roundhouse.